iPotty - the iPad accessory making toilet training a technical business! 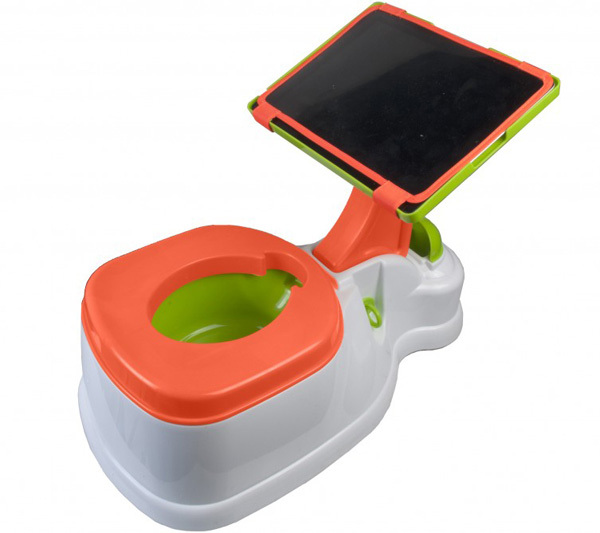 iPotty – the iPad accessory making toilet training a technical business! Strictly speaking, toilet bowls have been a no-go area for Apple devices, but believe it or not, an iPad accessory has just been created for toddlers in the midst of toilet training. Toilet training is tricky business and often the key element to success is found in the art of distraction – being able to have your child relax their body is of great importance. Now back in the good old days (or, let’s say, four years ago) we would read a book and cover our toilet walls with all sorts of posters and pictures a toddler might find interesting. Not any more. Instead, there’s the iPotty, where the distraction is right at your child’s fingertips. Fresh from being shown at the CES 2013 show, the iPotty from CTA Digital is indeed a trailblazing product that has to be seen to be believed – a potty with a built-in iPad stand and device shell. Before you call crazy on this one, let it be heard that various distracting iPad toilet training apps are available for download, so the concept isn’t completely lost on me. For those that have survived toilet training previously, you may well be thankful for CTA Digital for the forethought of raising the iPad above floor level and including a touch screen protector with their product. The iPotty will be available from March and will retail at US$40. Tell us Babyologists, what do you think?